leaf print, originally uploaded by ordinarymoment. Another Pinterest Challenge project, from younghouselove.com. 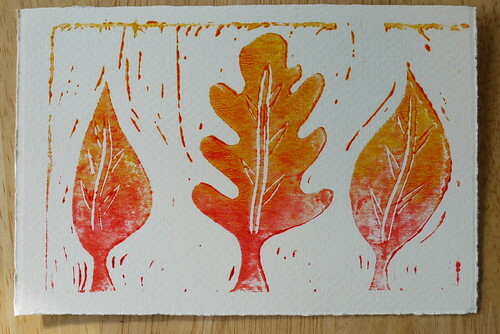 Inspired by the colors + leaves of autumn, and this, this, and this image from Pinterest, I carved a simple leaf stamp and printed it onto cardstock with gradating ink in fall colors. The beauty of printmaking is you can make multiple copies, so I created four cards to give to some special family members whose birthdays were quickly approaching. I still get excited every time you first peel back your stamp from the paper. Simple, instant (well, after you’re done carving anyway), fun! I so enjoy sharing my creations with my nearest + dearest. And I so adore this time of year…stay tuned for some more fall inspired photos.